I have a new Best Friend. 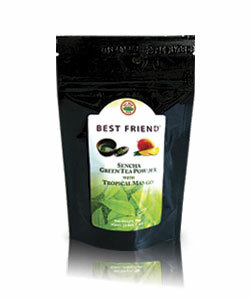 As in Best Friend Sencha Green Tea Powder by Sei Mee Tea. A healthy blend of organic Sencha green tea and mango powder that wisks into a beautiful, smooth and pleasing brew. Sei Mee Tea out of Enterprise, OR does a nice job of matching ingredients to ensure blends that are subtle yet memorable. Nothing over the top. No gimmicks. Looking for the highest antioxidants? Sencha is your choice. Want more caffeine? Go for Matcha. Both powders offer a pure way to get the full leaf benefit. For a special treat, I mix 1/2 tsp of Best Friend into 1 cup of hot water; add 1 tbsp of Coconut powder and froth it into a frenzy. Delicious! Available at Market of Choice, Whole Foods and Food Front for about $4.99 for the 19 servings pouch. Or order online from Ground Green Tea. Tip: Powder teas are highly concentrated and have a long shelf life. Great in recipes for everything from smoothies and ice cream to egg dishes and soup. Experiment and have fun!